In The Light of What We See – Spotted In The Wild! 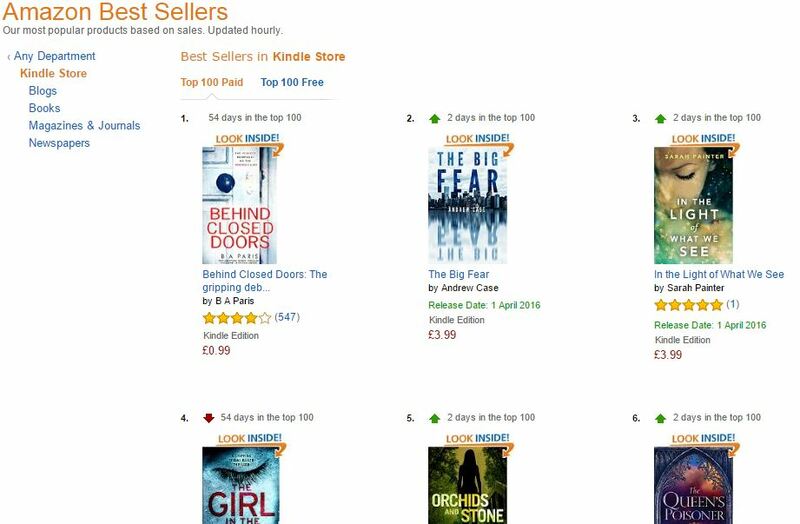 My book cosying up to The Night Manager in the Kindle Chart! I apologise for my continuing obsession with In The Light of What We See. Normal service (AKA book recommendations, cat pictures and writerly fretting) will be resumed shortly. 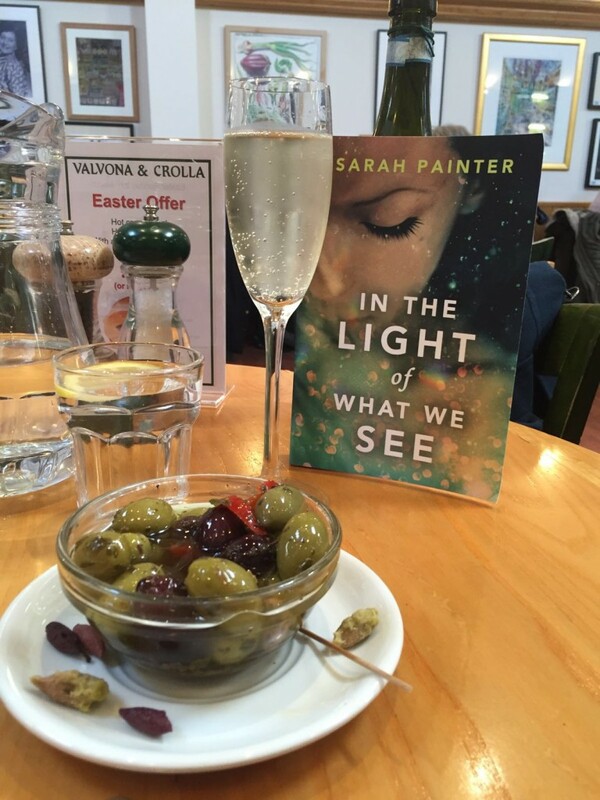 There’s one from my friend Rachel… Doesn’t my book look lovely with a glass of bubbly? What an EXCELLENT combination. 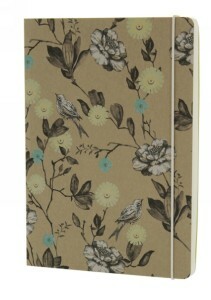 Also, a big thank you to Aimee, who posted the lovely Kindle pic on Twitter. 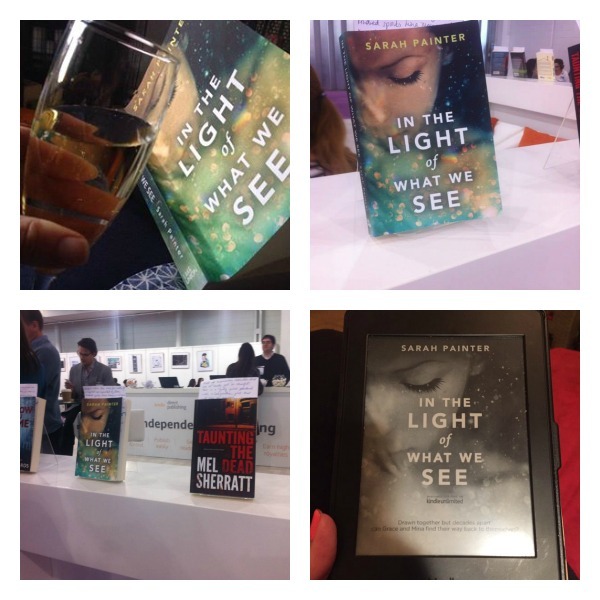 Also, for those who may not know, this week was the London Book Fair (massive industry trade show). Keris Stainton (YA author and wonderful human being) spotted my book on my publisher’s stand and was kind enough to take some snaps. I almost fainted with excitement when I saw them. Seriously. I have been reading about London Book Fair (and deals struck there) for a decade and now my book was there: Displayed next to mega best-selling superstars Mel Sherratt and Mark Edwards. Meep! I have also been thrilled with the number of book bloggers who have taken the time to read and review the book. Thank you to every single one – I am hugely grateful. In other news, I have been struggling with the WIP, drowning in a sea of admin (courtesy of my volunteer role at local youth theatre group), and trying not to let publication/deadline stress take over my life. Ha. I am almost at the end of a new (very messy) first draft and that’s a bit of a tense time. I wrote about my fear of finishing over on The Worried Writer, if you’re interested. Thank you for visiting and I hope you have a lovely weekend! In The Light of What We See Publication Day! Meep! I am thrilled to share this book with you all and I really hope that you like it. It’s a story I have wanted to write for a long time, and Mina’s voice came to me very clearly back in 2010, when I was doing my masters in creative writing at St Andrews university. Now, a mere (!) six years later it’s a proper shiny book and on the shelves. Yay! I am celebrating with a meal out later on (and the champagne in the picture). Thank you so much for reading and for all your support. I truly believe in this book and, of course, am super-nervous about its reception/whether it will do ‘well enough’. It definitely helps that I woke up to find over forty five star reviews on Amazon, and the book sitting in the top hundred on the bestseller chart – phew! In The Light of What We See – available now in audiobook, ebook and paperback. Word of mouth is still the biggest factor in a book’s success, so if you could tell a friend, send a Tweet or leave a review, I’d be over the moon. Nancy Beaton as a Shooting Star for the Galaxy Ball, 1929 Photographer: Cecil Beaton. This is an important image in the book and I had a print of it sitting on my desk while I wrote. When I’m writing I like to collect images which ‘feel’ like my book. In the past, I’ve even made paper-and-glue collages, with small objects and found ephemera stuck into the mix. Visual details and setting are very important to me, but the first draft tends to arrive in the form of characters talking. In The Light of What We See was no exception, so I used an inspiration board of digital images to help me. The board (like the book) includes ghost birds, the beautiful Gower peninsula in South Wales, Brighton, nurses, and the Royal Sussex Hospital. In the early stages, I use pictures of people as ‘placeholders’ for the characters. They don’t necessarily look the same as the character, but they evoke a feeling or attitude which helps me to write them. Pretty quickly, I get to know them through the story and they take on a life of their own. Evie and Geraint look (and feel) completely different in my mind, now, but the inspiration board was a massive help in the beginning. Unusually, I didn’t use images for either Mina or Grace (the main characters) as they arrived so fully-formed and definite that I didn’t need them. As this book is half-set in 1938, I did a fair amount of research. The pictures serve as shorthand reminders for that research or, again, just to set a certain mood in my mind before writing a scene. 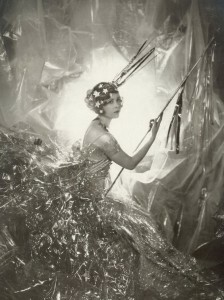 I have collected quite a few of the images I used onto a Pinterest board if you are interested. Out on Friday – meep! Also, don’t forget to enter your email address here to be in with a chance of winning book swag on Friday! I will pick three names at random from my mailing list on Friday afternoon. Also, Lake Union are running a GoodReads giveaway which ends on Friday. Head here for your chance to win one of twenty paperbacks. Publication Celebration Giveaway – Pretty Book Swag! On the weekend, I took my book out for lunch in Edinburgh, and a good time was had by all… As you can see, my book likes a splash of Prosecco. Quite right, too! 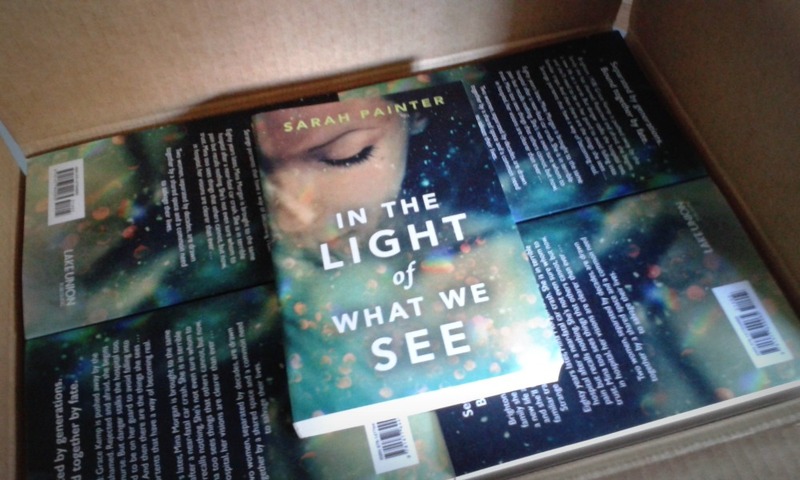 As promised, I have procured some goodies to giveaway to celebrate the publication of In The Light of What We See. 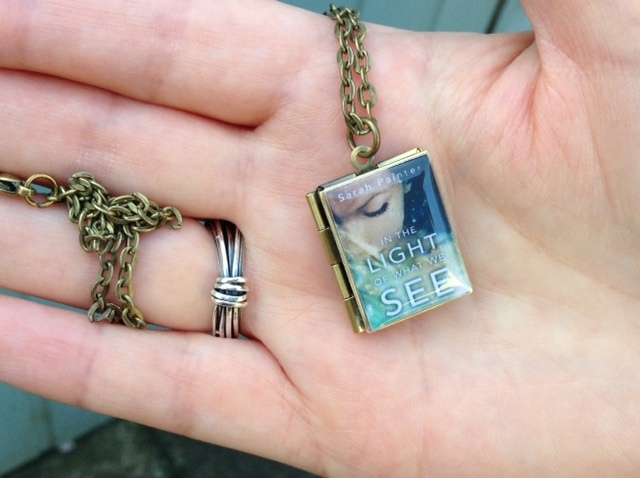 I have had two gorgeous book lockets made. They are quite tricky to photograph, but here’s one held by me. The locket measures 22 x 17mm, but might look as if it is larger in my small-ish hand. The locket opens and has spaces for two (tiny!) pictures/photos. I also have some notebooks (one bird-themed as a nod to the ‘ghost birds’ which appear in the novel) and one with my book cover, and some lovely postcards. FOR THE CHANCE TO WIN – SIGN UP FOR MY NEWSLETTER HERE! 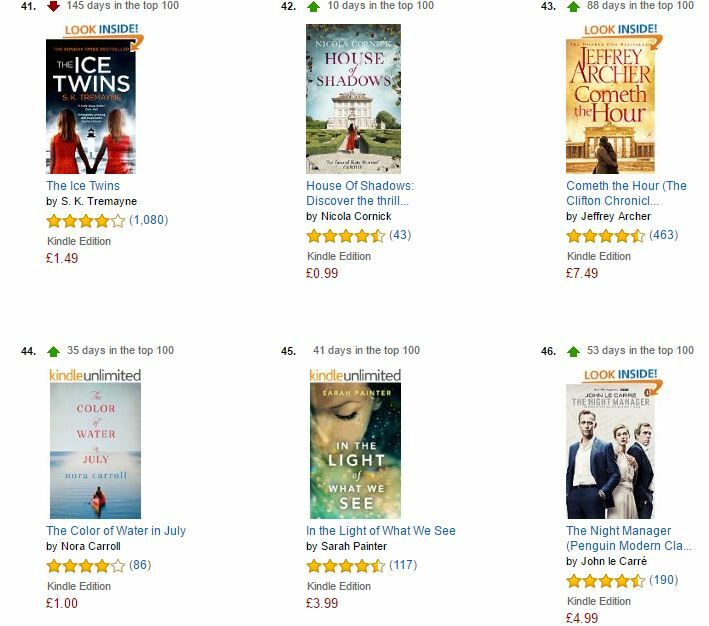 In other (boasty) news: In The Light of What We See is still in the top 100 ‘Kindle Bestsellers’ chart. Huzzah! Thank you to everyone who has bought it, reviewed it, or spread the word. I am so grateful! *Giveaway is open Internationally and closes at midday (GMT) on 1st April, 2016. 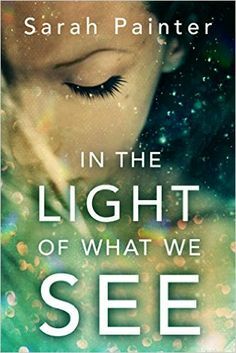 In The Light of What We See Picked for Kindle First! So, um… This happened. Meep! Something a little bit exciting happened with In The Light of What We See, but I was strictly forbidden from talking about it… It’s been killing me! The book has been chosen as a Kindle First title, which means it is out (Kindle format and in the UK/Australia only) right now. During March, members of the Kindle First book club can pick up a copy of the book for just 99p and read it ahead of official publication on 1st April. I’m sorry I couldn’t tell you about this before – I hope you will forgive me. I also hope you’ll forgive a little horn-blowing… In The Light of What We See hit number 3 on the Kindle chart yesterday. Whoop! It’s also currently NUMBER ONE in the ‘Contemporary Fiction’ chart on the Australian Amazon. Thank you, Australia! I’ve also received my first three reviews and they are all five star… Cue a massive sigh of relief! If you’re in the UK, you can join Kindle First (for free) and grab your copy for 99p here. For Australian readers, the price is $1.99. For those in the rest of the world, there are only four weeks to go until official publication; do pop back next week (or sign up here) to hear about a pre-launch giveaway. Do you remember the bit in Back To The Future when George McFly receives a box full of copies of his latest book from his publisher? Well, I’ve dreamed of that moment since I first saw the film, and last week it actually happened! Meep! I will apologise right now, but this blog (and some of my social media) is going to be heavy on the meeping. 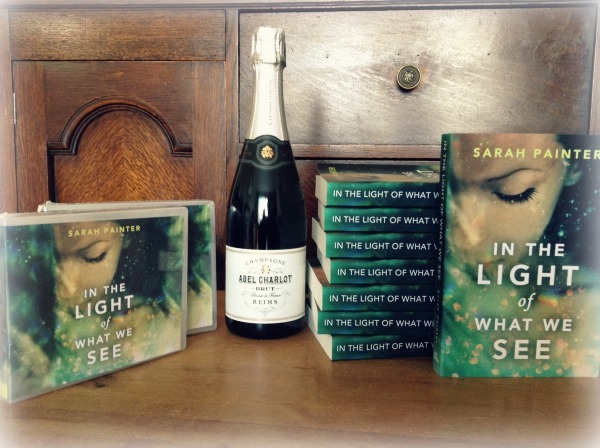 It is five weeks until In The Light of What We See hits the shelves and I am so excited I may just burst. Excited, too? Thank you! You can pre-order it here, add it to your bookshelf on GoodReads or sign-up for my newsletter for the chance to win some celebratory book swag. Paper sculpture by Su Blackwell. In other news, I have been drooling over Su Blackwell’s beautiful book sculptures (again!). She has a book out with beautiful photographs of her work, but I would love to see the real things. One day!